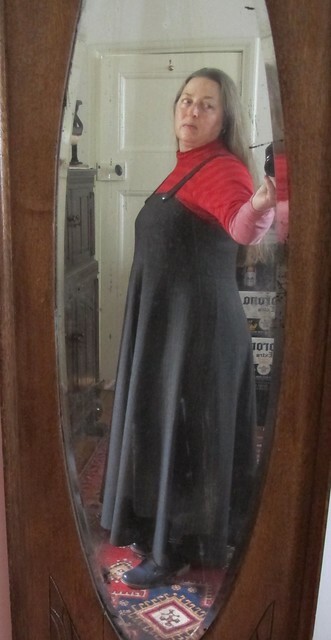 I was mucking about trying to find a less structured pinafore bodice that I was happy with. I’d cut a princess seamed one again and didn’t like the idea. Ended up with this. The back is a simple rectangle. The front has a horizontal bust dart and a slightly curved centre front seam. Then I interfaced the top edge with plain linen, faced it with slippery rayon lining satin, added straps, sewn in at the back, buttoned at the front, and a long eight gore skirt. 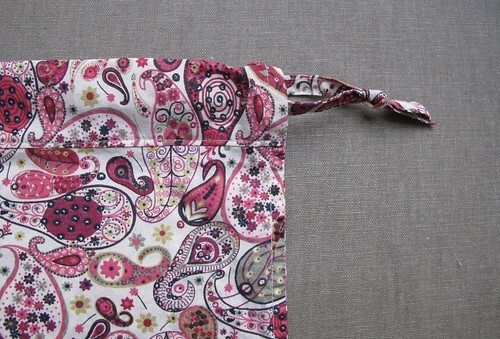 Because of people I hang out with, I realise that if you squint, it looks a bit like a viking apron dress. 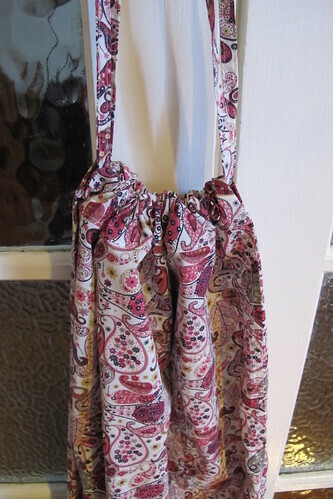 Or maybe a winter sun dress. It’s really comfortable and I like the drapey fullness. Oh and the fabric is a soft mid weight wool suiting. Of course it will most often be warn with extra warm things, so one just sees a long, slightly flared dress. 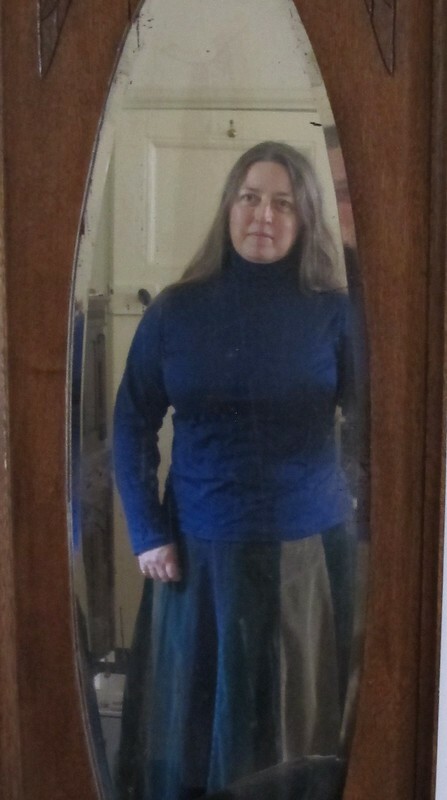 The cardigan was knitted for me by a good friend from natural coloured wool bought when staying with other friends in NZ. The hat is fibre from an alpaca kept by an old colleague, spun by a different friend and knitted by me. I love the multiple layers of links and story one can build in custom made clothing. Here is today’s prepped project clearing achievery. I had decided what I was going to do with this glorious thing and put the bits in a pile, which I was dropping things out of every time I shifted said pile, especially the tassels. Before I lost anything, I thought I’d best put it together. 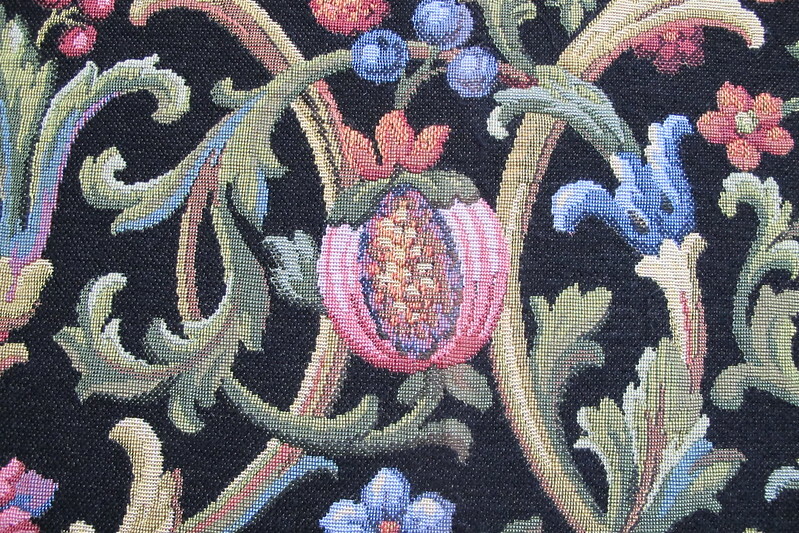 This is a detail pic of a large fabric sample bought from Redelman Fabrics in Sydney. They sell outrageously high end furnishing fabrics. The prices are pretty outrageous too. Too rich for my wallet, except for the occasional remnant or sample. This piece is big (~65cm square) with a large scale pattern woven in 100% cotton. The huge scale of the pattern and lack of repeats meant it didn’t want to be cut up, or even folded. So I decided to treat it as fabric art. I just squared it up, bound it in shiny green silk (a friend’s stash gift), gave it hanging loops, and a set of tassels reclaimed from an old moth eaten project (literally, leaving wool hanging about exposed all year is a bad idea). I think it looks rather lovely, and fills an empty bit of wall nicely. 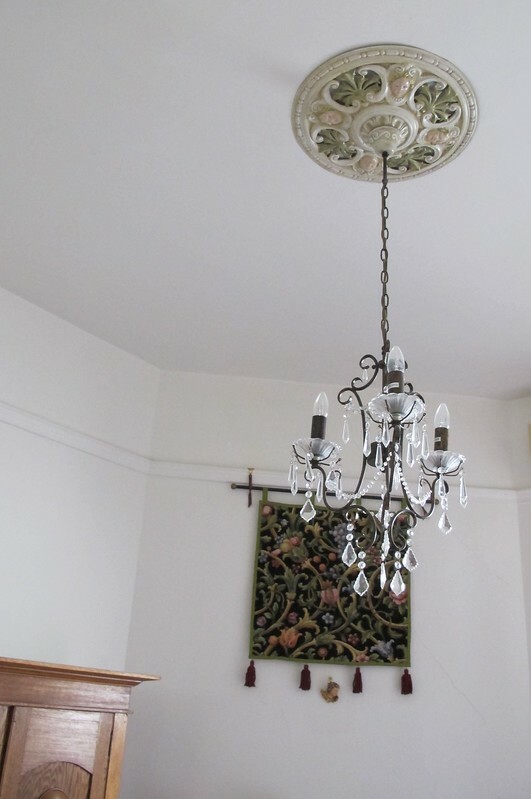 The hanging rod is cut from one evicted from another room after a rearrangement. 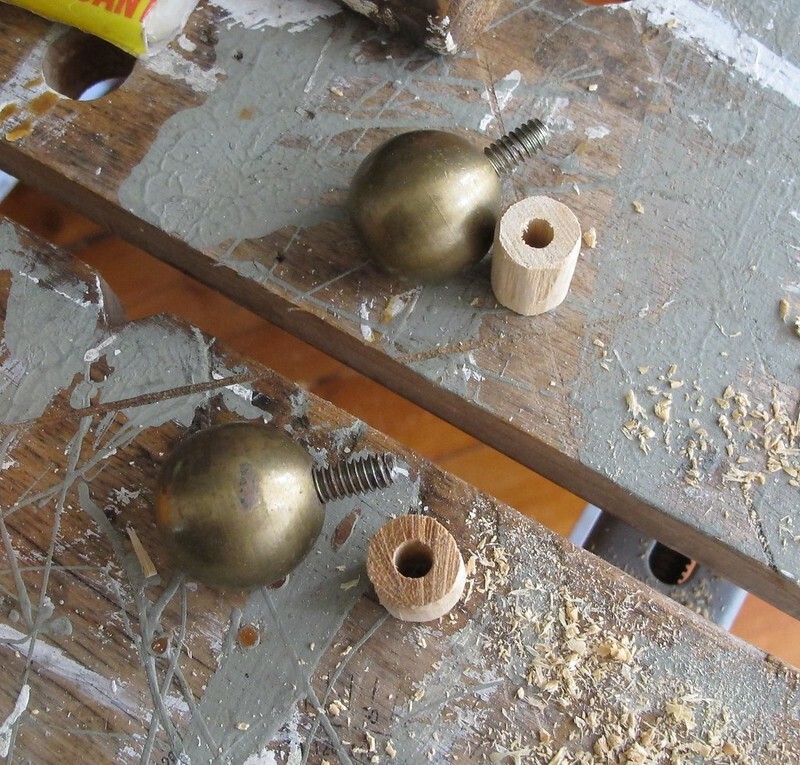 I decided to make finials out of a pair of solid brass ball fittings that came off something or other. Can’t remember what. Furniture maybe? I drilled a couple of short lengths of dowel and shaved these down so they fit in the ends of the rod. Hurrah, the brass balls are back in use and I didn’t have to buy new finials. 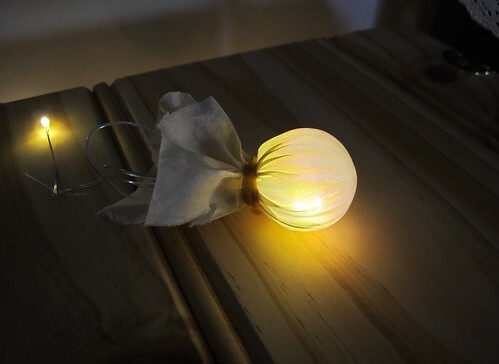 This shot is trying to show how shiny the silk is, using a torch. 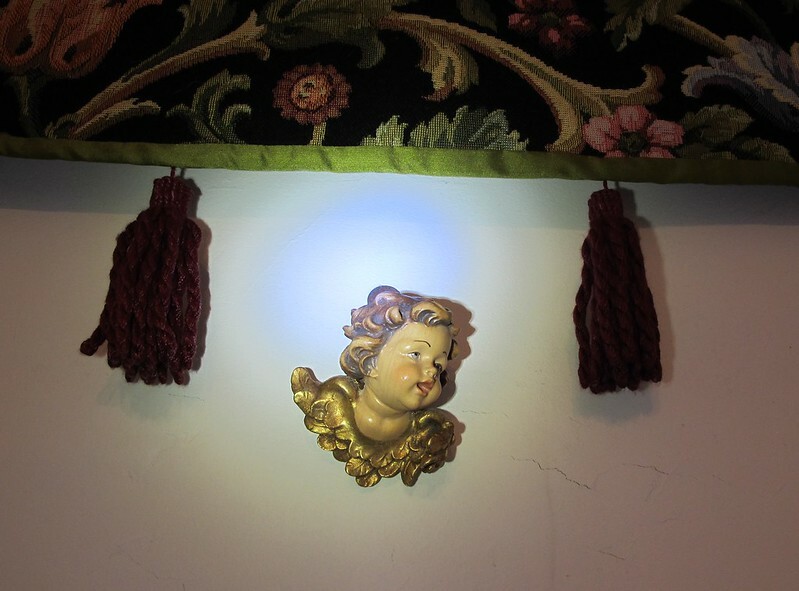 It accidentally give the little cherub a halo, which I’m finding amusing. Cherub is hand carved wood and handpainted, a really lovely thing. 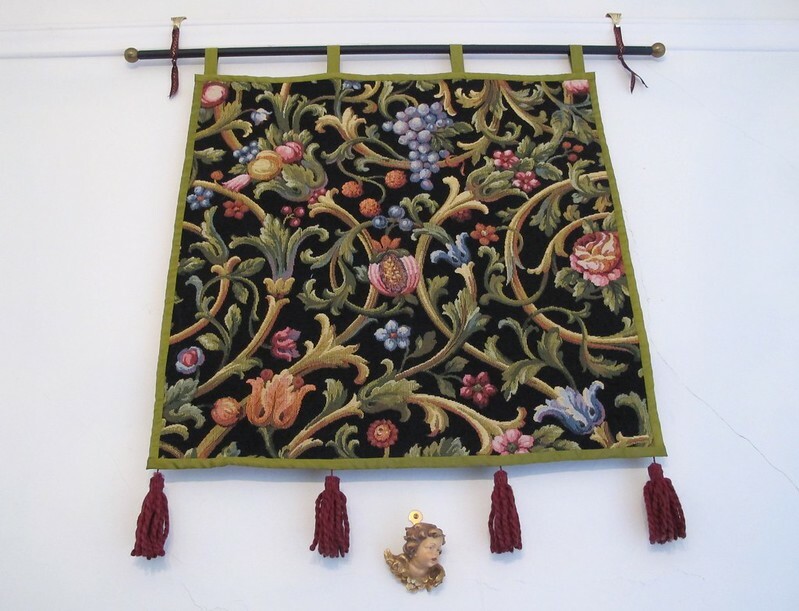 It demanded to come home with me from somewhere or other in Italy rather a lot of years ago, and is hanging there to occupy an existing hook. Attempting to show how well the new hanging goes with other things in the room, without showing the ugly room heater or the untidy mantlepiece. In this case, a new brewing bag. I’m working on clearing the decks. My project planning has leapt ahead of my completion rates. I realised I had at least five items cut out or pre dyed, but not progressed. I figure I should actually finish a few before I cut anything else out. I had cut out a new brew bag on a recent mad day of three consecutive beer brews. I had intended to use it that day until I came up with an alternate plan that didn’t need it and simplified matters, which was welcome. I thought I’d better sew it up anyway while I still knew where the pieces were and what they were for. The old and the new. The old one is a veteran of nearly 6yrs brewing. It’s still perfectly fine to use. Whiter than usual after a long soak. 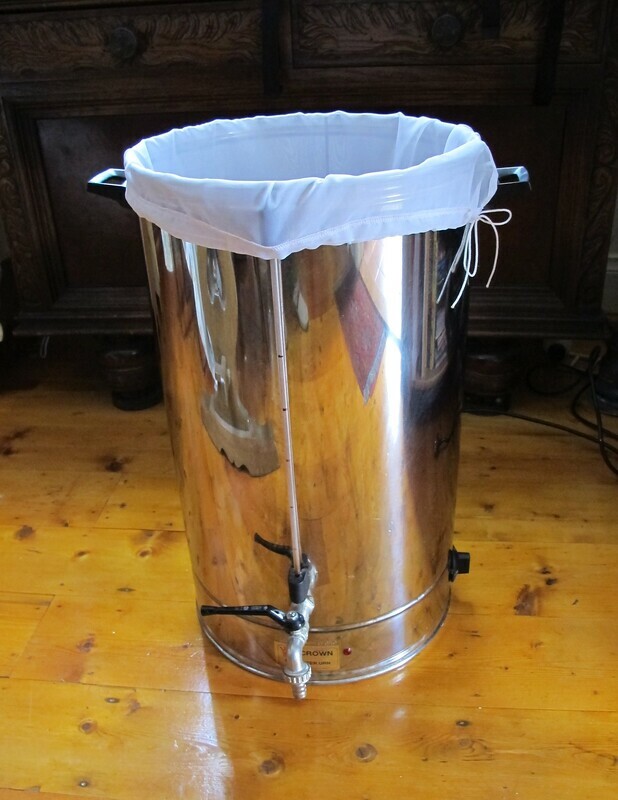 and for context, this is the old bag, suspended above the urn to allow the new wort to drain out of the grain. 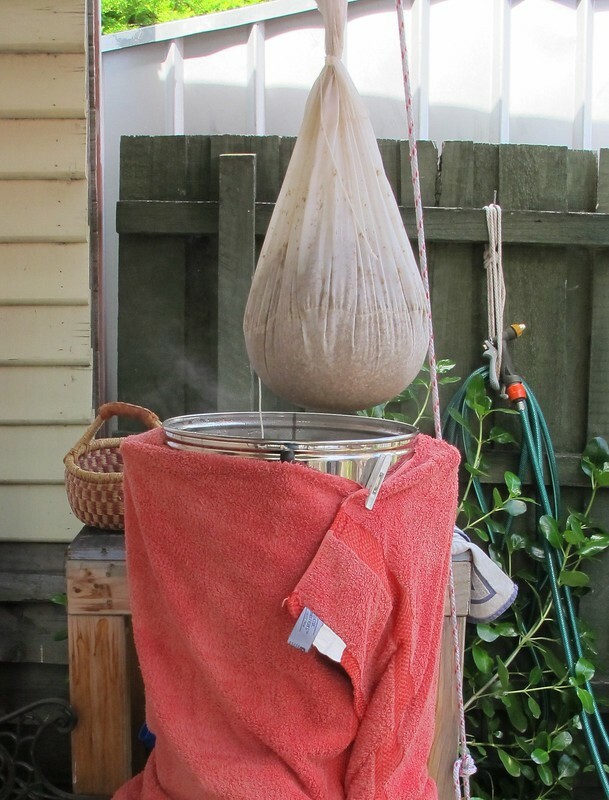 If you are curious, look up BIAB (Brew In A Bag) brewing. both machines were set up for fine knits, and I really don’t like changing the needles in the overlocker. I felt the need of some plain skivvies that I was willing to throw in the dryer. I have a few in lovely fine Italian mercerised cotton, but to preserve the smooth finish on those I insist on line drying. 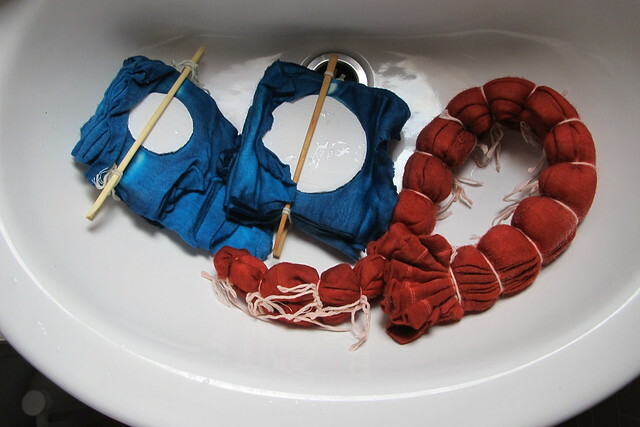 The red and the blue fabrics are both very thin cotton knit. Awkward to work with as it sticks to itself, curls up with little provocation and refuses to sit well on grain. The blue came to me free from someone else’s stash, but was in three pieces, had a few holes in and some white marks that I’m assuming might be candle wax. I’m pleased I managed to cut two full shirts from it. The rest has been cut up for rags. The red was bought cheaply from a bolt end shop and was stretched a long way off grain. I worked hard to get it sitting properly, surprised those stripes ended up as straight as they are. Annoyingly there wasn’t quite enough of the red to cut the second pair of sleeves. As is fairly obvious, I didn’t bother ironing them before taking pics. 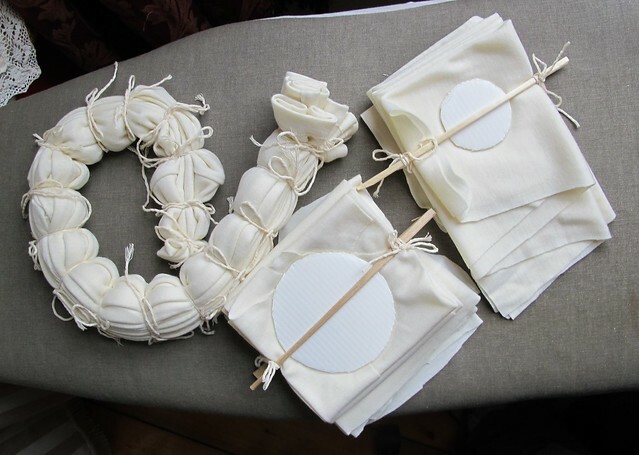 It’s not only worth sewing these to make use of what would have been waste fabric. I also have trouble finding skivvies to fit the way I like them. If one can find them at all, the neck is too tight and the sleeves too long. 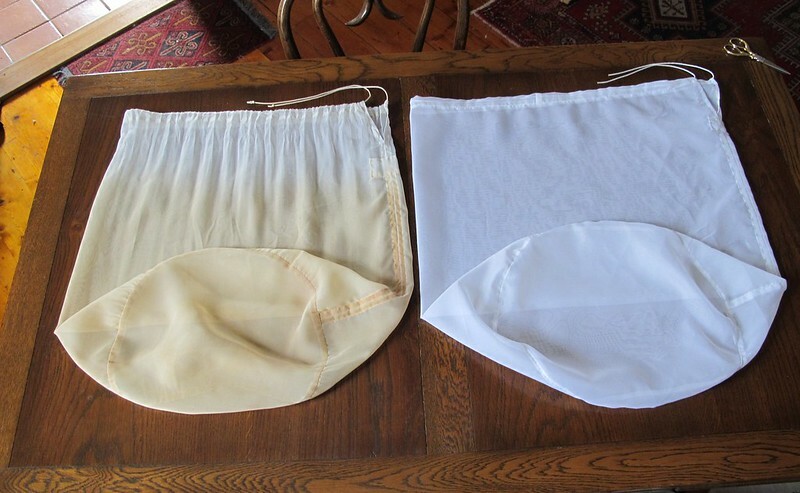 They may not be fashionable, but they are useful garments for under heated winter houses. Now I get to move on to the thing I actually wanted to be working on, after changing the needles in both machines. I wanted a few fine wool jumpers in a looser fit and bright cheerful colours. I found some beautiful soft cream knit fabric for very little money about a year ago. Cut out two skivvies. Run one up. Only one because the patterning plan (as it turned out, not the best plan) was going to work better on flat fabric. 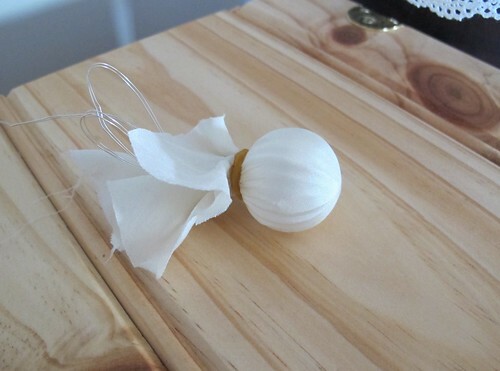 Fold and squish and tie with string. The “reveal”, the most fun part of all. Actually, I fib a little. The blue one turned out like this to start with. Oh my. Eep. I didn’t want to look like a strange many breasted creature, so I retied this one. 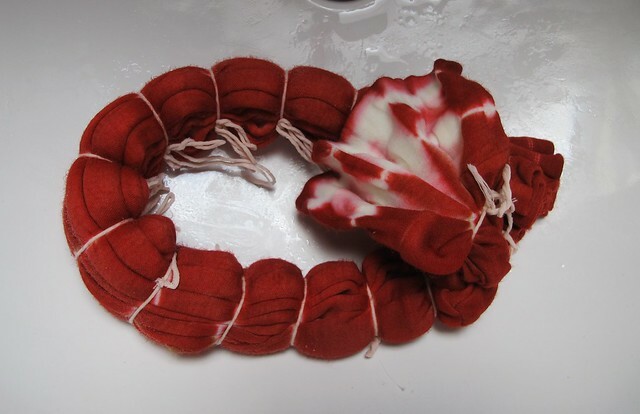 Fewer strings than the red, having just been reminded how easy it is to resist the dye. 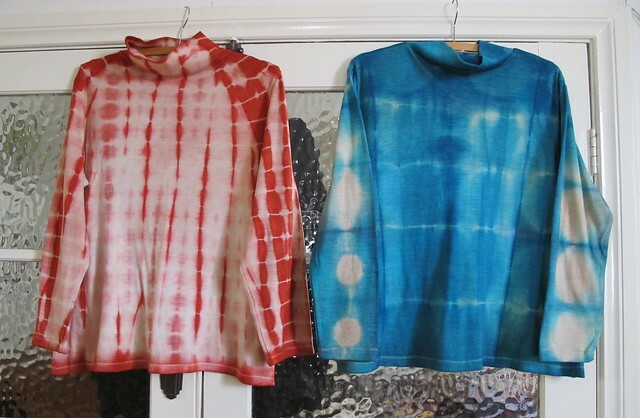 I didn’t overdye the sleeves, I was happy to retain the spots there. 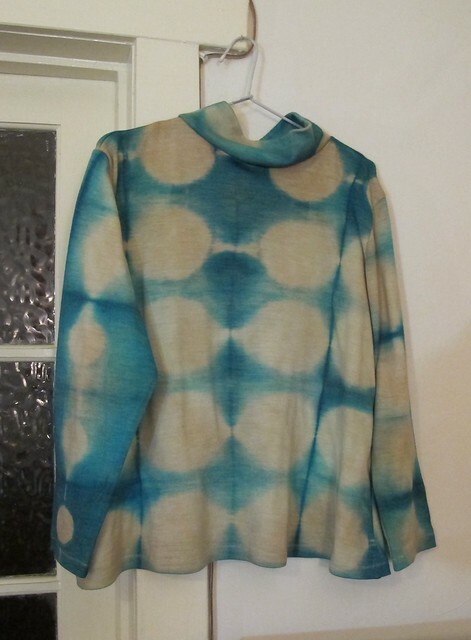 Thankfully, the second dyeing gave a garment I am willing to be seen in. I’ve a little more of the fabric. Maybe enough for a third similar garment? If I decide to cut that, or anything out of such stretchy fabric I will try to remember to cut the neck hole smaller. 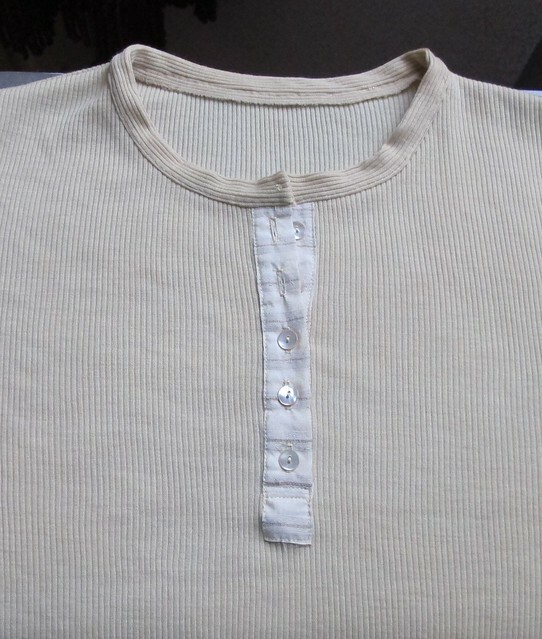 I’ve been wanting for a while to try a woven fabric placket on a knit shirt. I love henley style shirts but my every attempt to put buttonholes in knit fabric has resulted in disaster. This garment is reasonable proof I think, perhaps not of concept, but of my ability to work this technique. 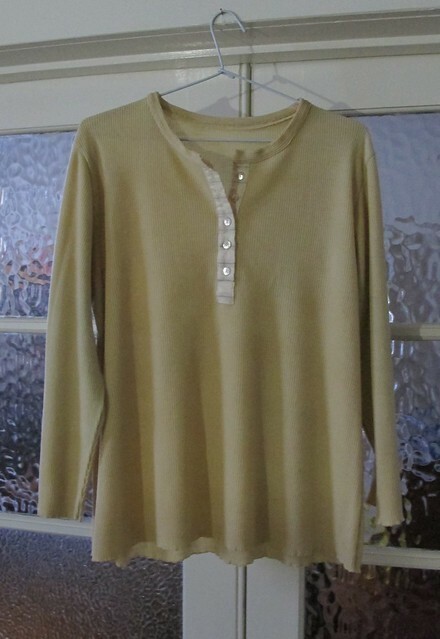 The main fabric is fine merino wool rib. The same base fabric as the Paua cardigan, but overdyed with crab apple bark as described in this post. 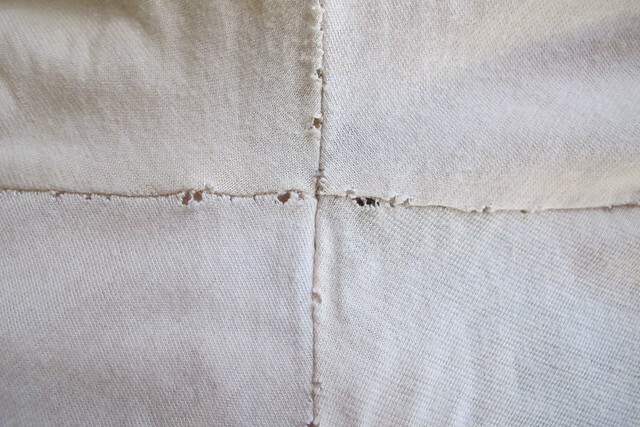 The placket fabric is a scrap of silk from a long ago jacket lining. Buttons are shell as usual. This pic is a better representation of the colour. It’s too dark and stormy today to get a decent pic of it on me. Ah, and I don’t think I wrote it in any of the crab apple dyeing posts, the tree was called Jethro. I’ve been an eejit. 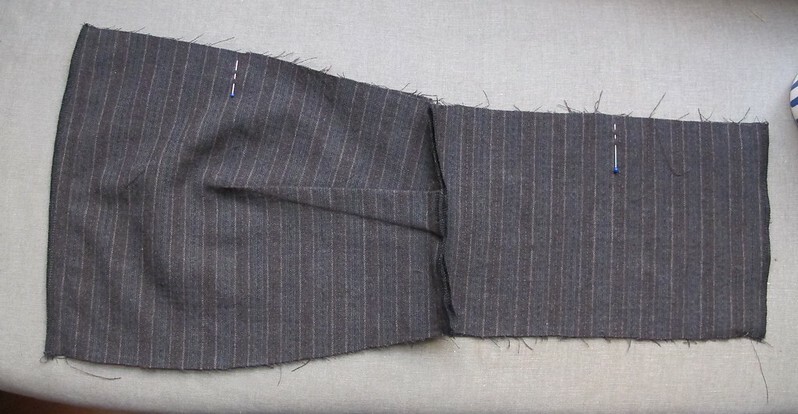 I’ve finally realised that this sort of seam failure isn’t the fabric being poor quality (although in this extreme example that was also probably a factor)…. It’s because I don’t change my overlocker needles often enough! I should also pay attention to not just frequency, but type. I have simply used #80 universal needles for everything thus far, and each pair for way too long. This is ok for most kinds of woven everything. NOT for fine knits. I’m reluctantly admitting that I ought change needles before and after a bout of fine knit sewing. So I have just brushed out the machine, oiled it, fully rethreaded* and put in fresh #75 ballpoint needles. 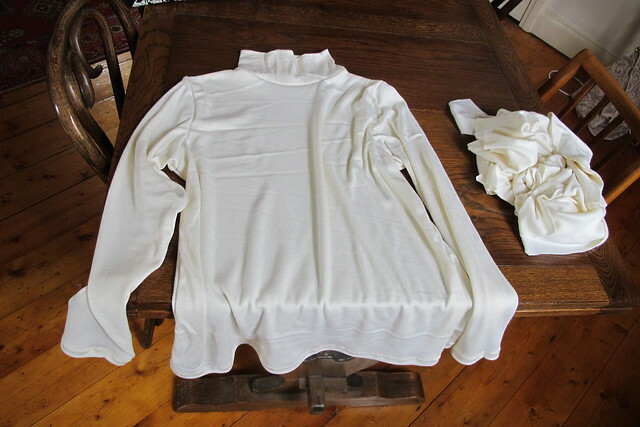 All in preparation for some mending of fine merino long johns. I will try hard to remember to change the needles back before working on heavier woven cloth. I’m grateful that I can now manage this without reference to the manual. Makes the whole job less confronting. I’ve been aware for some time that I wanted a laundry bag for traveling. While not getting around to making one I had been musing on what qualities I wanted in it. -visually different from the rest of the contents of my luggage. -as always, natural fibre preferred. After thinking of, then rejecting a number of options, I remembered an old defunct garment. 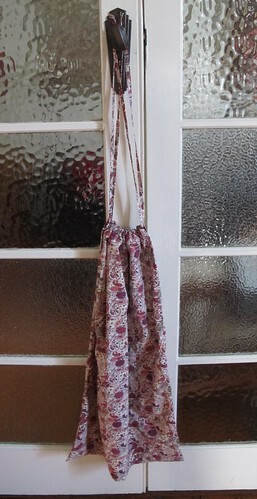 Now too small and burgundy no longer being my friend for wearing, I could claim the lovely Liberty lawn for a laundry bag. 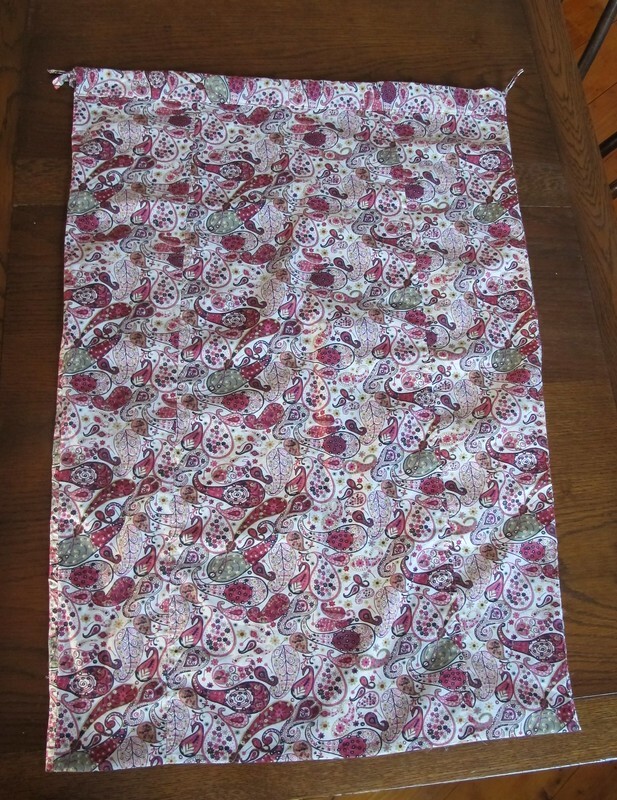 An unused thing isn’t taking up space and I get to enjoy the gorgeous paisley fabric in a new shape. It ticks all the boxes. It’s 80x52cm and weighs only 100g, which is less than most tshirts. Skiing in the land of 8000 suns. One of the requirements is to have a light source in there. Bright enough, but not too bright. 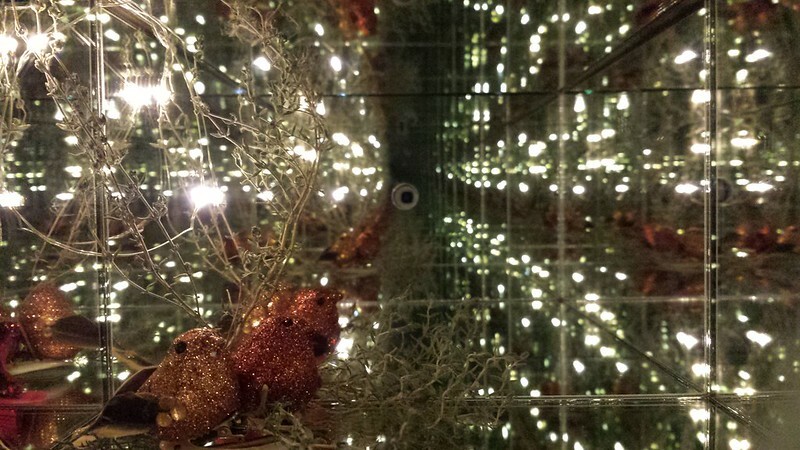 The tiny LED lights are a bit dazzling on their own. So I thought I’d try something else. 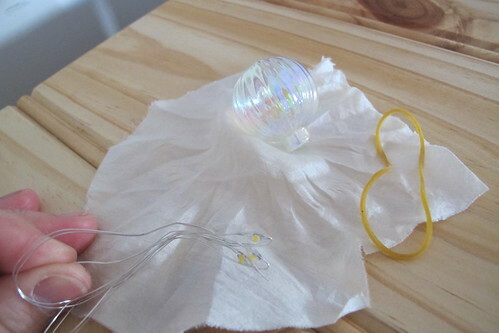 is a tiny glass tree bauble with it’s hanger removed, three LED lights put in through the neck and covered by a scrap of white silk fabric, held by an elastic band. 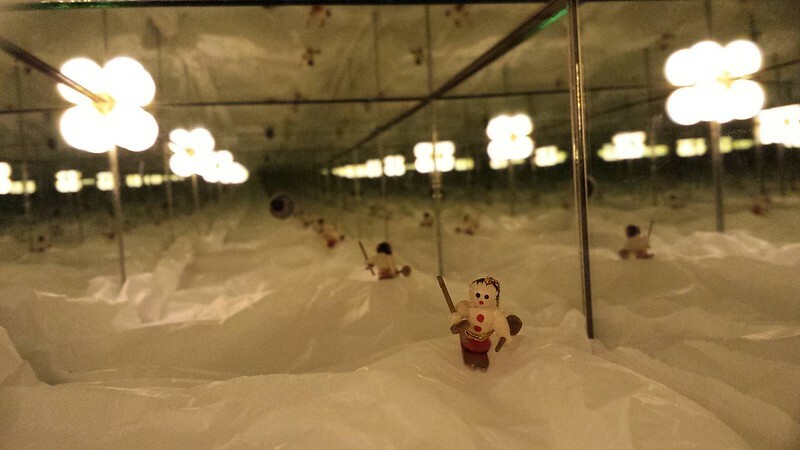 The “snow” is just tissue paper.